Each Broken Yolk location makes approximately $2 million in revenue annually, according to Gelastopoulos. There are 15 Broken Yolks located throughout San Diego County, as well as in Northern California, Arizona, Florida, and Illinois. 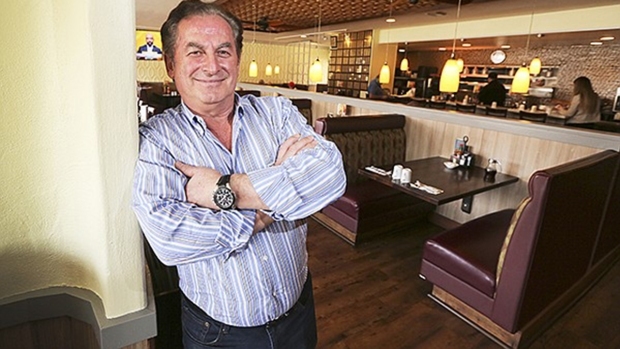 This week, 59-year-old Gelastopoulos will be opening the 32nd Broken Yolk franchised restaurant, this time in Spring, Texas. Each location makes approximately $2 million in revenue annually, according to Gelastopoulos. There are 15 Broken Yolks located throughout San Diego County, as well as in Northern California, Arizona, Florida, and Illinois. In the next few months, Gelastopoulos, with the help of his 10 or so corporate team members, will open three more Broken Yolk Cafes: one in Las Vegas, a second location in Arizona and an additional one in Fullerton. It all started in Pacific Beach, where he purchased the first location in 1993, enticed by its breakfast and lunch hours. And, although he’d been working in the back-of-the-house of various San Diego restaurants since migrating from Greece at the age of 17, as well as moonlighting as a restaurant broker by day, he didn’t quite know what to expect. After a couple of weekends with a pretty empty dining hall and not very many patrons coming through the door, Gelastopoulos decided he’d call a few friends and invite them to eat at his restaurant for free. He’d come out while the customers were eating, shake hands with them, thank them for coming and ask them to come again next week and eat, again, on the house. He repeated the same promotional tactic every weekend for six weeks, providing comp meals for guests, and, before he knew it, the Broken Yolk had lines out the door with random customers wanting to know what all the hype was about. That momentum is still going. Before owning Broken Yolk, Gelastopoulos didn’t know much about running a business. He started off working as a dishwasher at restaurants around town and moved up to the hot-line while attending school. In 1993, Gelastopoulos got his real estate license and became a broker, selling restaurants. That’s when he came across Broken Yolk Cafe. At first, he was the seller. But, after convincing the owner, he became the buyer. But, Gelastopoulos, married and with two kids at the time (he later had a third child), had no money. He said he and his family were living paycheck to paycheck back then and could barely make ends meet. So, he convinced his wife to let him charge $45,000 to their collective credit cards and assume the previous owner’s bank loan of $280,000 to buy Broken Yolk. Gelastopoulos’ three children and his son-in-law all work for Broken Yolk Cafe in some capacity. His eldest daughter is the vice president of franchise support, the second daughter handles all the menu innovation and creation, and his son, who he says is “a millennial that thinks he knows everything,” wears many hats until they can figure out together what best suits him. 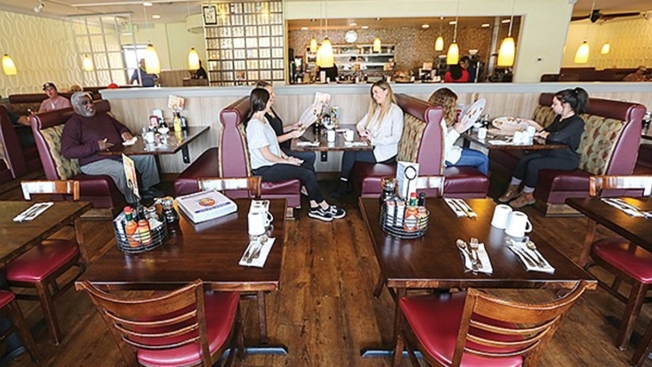 Franchising for Broken Yolk Cafe didn’t start until around 2008. In reality, Gelastopoulos hadn’t thought about expanding when he began to get approached about franchising opportunities. He says, at the time, he was content with things as they were: the business was doing well, especially during the summer time, the kids were in good schools and he’d gotten his wife the house with the white picket fence. He was living the American dream. But, a customer who’d come by almost every weekend to the Pacific Beach restaurant kept pressing Gelastopoulos about having his own Broken Yolk location, until the two agreed to give it a try. Shortly after, the second Broken Yolk opened in Eastlake, and “it took off immediately,” said Gelastopoulos. A friend of his who visited the opening of that restaurant got excited and said he wanted in, so, not long after that, a third Broken Yolk Cafe opened in Chula Vista. And the rest, as they say, is history. “I am very hands-on,” Gelastopoulos said about his involvement with the franchises. In fact, as he prepared the opening of the new Spring, Texas, location, he said he and a team of about seven were already there training the staff and showing them the ropes. This included members of the support team, graphics, social media, marketing and operations. Expansion aside, Gelastopoulos said he faces some of the same tribulations that other restaurant owners around town have to deal with, including rising wages. He said he’s had to trim hours to help keep costs down and the operation sometimes runs with a very slim team, but never to the point that service is compromised.